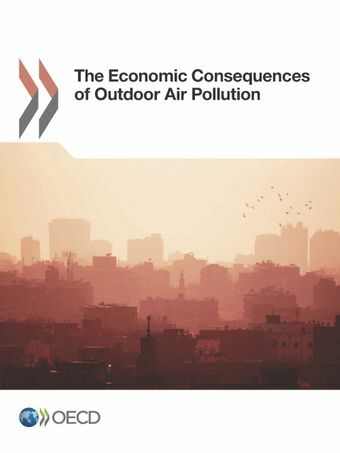 This report provides for the first time a plausible global projection of the magnitude of the economic consequences of outdoorair pollution in absence of policy action other than those already in place. The projections thus reflect the costs of inaction of outdoor air pollution. The OECD Environmental Outlook to 2050: Consequences of Inaction took no account of the feedbacks from environmental challenges and resource scarcity to the economy. This report seeks to address this gap through a detailed economic modelling framework that links outdoor air pollution to economic growth and welfare. The report focuses on the impacts of outdoor air pollution caused by high concentrations of particulate matter (PM2.5) and ground level ozone for the period 2015-2060. The report projects the market costs of outdoor air pollution (focusing on labour productivity, health care expenditures due to illness and changes in crop yields) using a modelling approach, which links economic activity to emissions of air pollutants, concentrations, biophysical impacts and finally feedback effects from these impacts on the economy. The analysis also evaluates non-market health impacts (mortality and morbidity) using results from direct valuation studies. Increasing economic growth and energy demand will lead to a significant increase in global emissions of air pollutants. Rising emissions, together with other factors, such as climate change, will lead to increasing concentrations of particulate matter (PM2.5) and ground level ozone. Increasing concentrations of PM2.5 and ozone will lead to substantial effects on health and the environment. In particular, premature deaths from outdoor air pollution in 2010 amounted to around 3 million people, while they are projected to be 6-9 million in 2060. The market impacts of outdoor air pollution are projected to lead to global economic costs that gradually increase to 1% of global GDP by 2060. Costs related to additional health expenditures and labour productivity losses dominate in the long run. The annual global welfare (non-market) costs of these premature deaths from outdoor air pollution, calculated using estimates of the individual willingness-to-pay to reduce the risk of premature death, are projected to be USD 18-25 trillion in 2060. In addition, the costs of pain and suffering from illness are estimated at estimated at around USD 2.2 trillion by 2060. The feedbacks from climate change on the economy have been analysed in detail in The Economic Consequences of Climate Change (2015). This report provides a detailed quantitative assessment of the consequences of climate change on economic growth through to 2060, covering a wide range of impact categories including agriculture, coastal zones, some extreme events, health and energy and tourism demand. The quantitative assessment is complemented by more stylised integrated assessment modelling of post-2060 economic impacts. Further degradation of the environment and natural capital can compromise prospects for future economic growth and human well-being. The OECD Environmental Outlook to 2050: Consequences of Inaction (2012) projected significant consequences of climate change, biodiversity loss, water scarcity and health impacts of pollution by 2050, unless more ambitious policies are implemented. The Environmental Outlook, however took no account of the feedbacks from environmental challenges and resource scarcity to the economy. Outdoor air pollution kills more than 3 million people across the world every year, and causes health problems from asthma to heart disease for many more. This is costing societies very large amounts in terms of the value of lives lost and ill health. Based on extensive new epidemiological evidence since the 2010 Global Burden of Disease study, and OECD estimates of the Value of Statistical Life, The Costs of Air Pollution: Health Impacts of Road Transport (2014) provides evidence on the health impacts from air pollution and the related economic cost. The Mortality Risk Valuation in Environment, Health and Transport Policies (2012) presents a major meta-analysis of “value of a statistical life” (VSL) estimates derived from surveys where people around the world have been asked about their willingness to pay for small reduction in mortality risks. The analysis seeks to explain the differences in the estimates, for example across countries. Differences in incomes and the magnitude of the risk reduction people have been asked to value were found to be the factors having the strongest impact on VSL, but a number of other policy-relevant factors are also important.